1.What was your reaction when they called your name as the VIC State Winner? I'm overwhelmed! I spent the most part of the day being blown away at the calibre of finalists so I had started to make peace with the idea that I wasn't going to win. When my name was read out, I didn't really react. I knew it was my name but I sort of waited for someone else to step forward. It's an extremely humbling feeling after knowing the group of amazing, intelligent and passionate people I was selected from. It gave me even more respect for them by receiving this award. 2.How did you first get into pharmacy? I pretty much fell into pharmacy. I wasn’t really looking for a career in this industry and I only took the job as it was nearby. Once I got into it, I found that it was an industry that I didn’t know a lot about and it was such a rewarding job. I’ve done other jobs in retail and while they were satisfying, it was just a completely different vibe once I got into pharmacy. It was a happy accident that I got a job in this industry. When I first started out, it was a full on job. It’s very different to other retail sectors in terms of what knowledge you have to have and being able to draw on a plethora of knowledge all the time and to your customers. It’s a constantly evolving role. I was retaining a lot of useless information in my old jobs and then when I got into pharmacy, I started to retain useful information. I found it to be something my brain worked with quite well. 3.Can you give me a brief overview of your career in pharmacy? I first started pharmacy in a little pharmacy group in Melbourne. They were really strong in training their staff. It was such a great start to a pharmacy role because straight away I learnt so much information and they were quite supportive of their staff and making sure they got recognised. For someone that had no pharmacy background, my only exposure to that role was going into a shop and just purchasing products. To then being able to work in this field was crazy. It just took off for me and I did really well in it. I started to realise I was quite good at this job. You need to be compassionate for your customers, otherwise you’re not going to get any job satisfaction. It was very rewarding dealing with people and seeing an actual result out of the advice I was giving, and noticing people were actually respectful and enjoying their interaction with me as opposed to my other experience in previous jobs. In pharmacy you see instant gratification. People will tell you straight away that they never knew something that you have given them advice on. To get that constant reassurance from your customers is something you just don’t find – at least in my years of work. I’ve progressively gone into bigger stores and taken on more responsibility and I’ve had more put onto me as I have been able to succeed in the role that I’m in. I can see that my career has been going on an upwards trajectory. This is the second time I’ve been nominated for the award. Unfortunately, I didn’t make it as State Winner last time, but to get recognised by my peers and be put forward for an award like this twice is really reassuring. It makes me realise I have done well. I’ve not always been good at admitting that I can do my job well. I don’t like taking credit for things even if I am good at it. Now I’ve realised I need to start accepting that reality and be more positive about myself. 4.How do you think training has benefited you in your career? I have a strong passion for natural health and I’ve learnt a lot. When I first started out in pharmacy, I had no idea about anything at all and I had to learn everything from scratch. I don’t like not knowing what it is that I’m working with. I needed to pursue my own knowledge for my own work. I needed to find out as much as I could. I did my S2/S3 training, training with reps, doing the trainings that were provided through the employers that I’ve worked for, going to off-site training as well - I just had to do as much as I could to make sure I had the right amount of knowledge. I didn’t know when I first started out if pharmacy was just a stepping stone for something else. But it’s something for me that I enjoy as I know that I’m quite good at it. I feel very comfortable in this atmosphere, especially the store I am in at the moment. It’s a completely different vibe to what I’ve been exposed to in other pharmacies. I do get a lot of fulfilment coming into this job. Every day is a challenge in itself but I don’t have plans to own a pharmacy or start being a pharmacist. But at the same time, I enjoy being a pharmacy assistant. The job for me is this job at the moment. The only thing I would want to get into is naturopathy and do both at the same time. The natural health side is really my strength and that’s where I really enjoy learning. 6.Tell us about your PATY experience so far? You do get a bit nervous about this whole concept about being nominated and put up against people for recognition for what you can do, but at the same time the experience has been incredibly positive. I’m not very good at taking compliments. Since being named as a State Winner, I’ve received a lot of recognition and appreciation through my employer, family, friends and the industry. For me, it’s very humbling in the sense that I now need to learn how to be graceful and accepting of those praises from people. PATY has been positive not only just for being recognised, but also for me growing up and realising that I shouldn’t be so tough on myself. 7.What was the workshop day like? This is my second time going to a State Workshop Day and it’s still quite nerve-wracking going into a room filled with people that were incredibly impressive. All the people in the room just blew me away. I’ve really just looked at this whole experience as an opportunity to get out of my comfort zone and learn from the experience. I didn’t go into it thinking about the final results of the day because having gone through it before already, I’ve seen how tough it is for all the judges to pick just one winner. When I started out I was very quiet. I didn’t really speak up but by the end of the day you get into it and you have a lot of fun. You start to realise everyone is as nervous as you are and there are people there that have a lot of experience in different things. They might sound like they have more experience than you, but you shouldn’t doubt yourself. If you compare yourself to others, you just won’t be able to absorb what is happening in the day. The people on the day, the judges and everyone that was there were amazing. They put you at ease and you can see everyone is there to support the people being nominated. It was quite honestly one of the most positive experiences that I have had. 8.What have you gained from PATY so far? Confidence. I was shocked when someone actually put me forward for a nomination. It’s taught me how to be a lot more confident and trusting that I’m actually quite good at what I do. I do feel a lot more confident when I’m interacting with customers, staff and helping people, as I do realise there is a lot more that I know than I give myself credit for. 9.Why would you encourage someone to nominate themselves or someone else for PATY? It’s a rare opportunity to give PAs the acknowledgement for what we do. In this industry, we band together and support one another when we have PBS reforms. When the pharmacy climate changes, we step it up. If there are new, major competitors, we adjust and work towards the same goals. So every once a while, it's a good thing to celebrate those team members who are working with your business to achieve these results. I feel there are so many unsung heroes in this industry that don’t get that nod from their employers that probably should. Getting nominated for this award really does confirm that the person is really quite good at what they are doing. So if you’re thinking of nominating someone, it doesn’t take a lot to nominate. It’s quite a positive thing to do for someone if you know someone who is good at what they are doing in the pharmacy industry. 10.What would you like to see change in pharmacy? I would love to see pharmacy assistants get a different level of recognition. I heard someone mention once, and it made a lot of sense, to take pharmacy assistants from the retail sector and put them into the health sector. I’ve worked in retail and this is nothing like any other retail experience. To refer to it as retail in itself sometimes has particular connotations to it. If we were looked at as more a healthcare professional in some capacity, it would be great. We do have a wealth of knowledge as pharmacy assistants and sometimes people look at us as just that – someone that’s just assisting as opposed to helping and improving their health. Sometimes the title can be quite dismissive. 11.What do you love about pharmacy? The one thing that I love about pharmacy is that instant gratification with your interaction with the customer. Everything else that you do is building up to the fact that you are there to serve and help your customers. Having customers who have seen and paid money for proper healthcare services, and then they come into a pharmacy and a pharmacy assistant has helped them with a particular condition, to get a result with that person is incredible. For that person to come back in and basically be dumbfounded that someone in a pharmacy has given them some health advice that no one else has given them before, it’s a real feather in the hat moment. They don’t happen every day, but to have the odd customer each week that has come back looking for me, I think that’s a really rewarding feeling. In my previous roles in retail, I’ve not really had customers that come back looking for me – you don’t get that repeat person whose life has been changed as a result of their interaction with you. That lingers with you when customers are happy. Who will be the 2018 National Pharmacy Assistant of the Year? 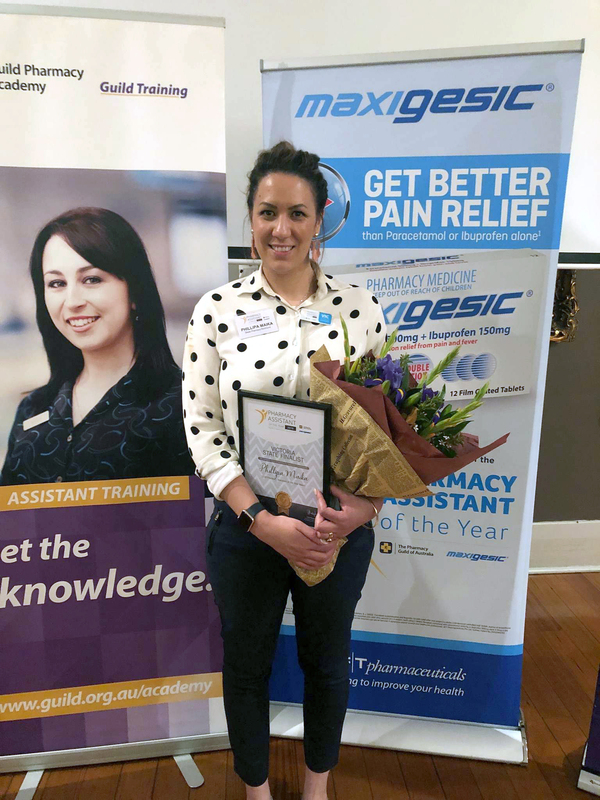 Support your State Winner Phillipa at the Pharmacy Assistant National Conference on 25-27 October 2018 at Sea World Resort, Gold Coast. Meet and learn from all of the State Winners on how they became the ‘best of the best’ during the Q&A session on 26 October. Then witness who will be announced as the National Winner at the Conference Dinner that night!